Potato Queen travel and lifestyle: Japan: How to ride a train in Japan? Japan: How to ride a train in Japan? Hello once again. It's been a while since I blogged about my Japan trip. The last post was tough to write because I had to research all over again to get the facts right. Prices and entrance fees might increase from time to time because I noticed there has been an increase of ¥10 - ¥20 as compared to 2013. But now I am going to provide a simple guide on how to ride a train in Japan. Unfortunately, I am unable to teach you how to read the signs and name of places. I decided to write this post to help you travelers because I myself faced trouble when getting on a train in Japan. I come from a place where there are no trains or subways so I wasn't familiar and easily get confused. Just look at the lines and dots below to get the idea. It is a map of Japan Rail (JR) for Kansai region. 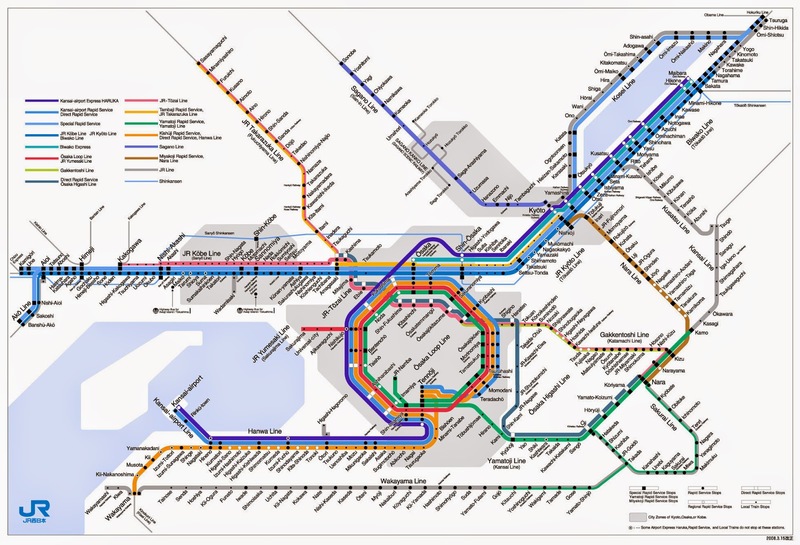 I have never been to Tokyo so I don't know how their railway system works but hubby told me its almost as complicated as this and has a loop line as well. I am also unable to teach you on how to ride a shinkansen because I have no experience on that but my husband does when he was in Tokyo. We took Japan Rail (JR) most of the time. Hankyu and other companies might not have as many type of train systems as JR therefore those are easier to ride. Please bring along a complete map like the second picture in this post all the time. One of the best website to do research on best route, timetable and pricing is Hyperdia. 1. Determine your destination and it's name in Japanese writing. - Not all stations display in English. - You can print out or save the names in your phone. 2. Identify the type of dot of your destination. - Not all trains will pass through every station. Those that are Rapid and Express will skip small dots which is the local stations. - You need to be extra careful if your destination is a rural area. 3. Find out if you must transit at any station. - You don't need to buy different tickets when you are transiting within JR. You need to buy another ticket once you get out of the station or need to ride with other company like Hankyu or subway. 4. Purchase ticket according to price. - Press for English on the ticket machine. See how much your destination costs on the board above the machine. Station names won't display on the machine so you purchase according to the price. - Example: I travel from Itami to Osaka and the price on the board is ¥230 so I just insert the amount into the machine and take a ticket which is worth ¥230. If I change my mind and decided to stop at another station, I will still able to get out provided the ticket for that station also costs ¥230. 5. Determine how many stops from your station to your destination. - This will help you in case you cannot hear or understand what is announced in the train. 6. Identify the name and colour of the line you will be taking. - Line colour will be displayed on the side of the train. - Example: I am going to Osaka from Itami so I will take Takarazuka line (yellow). 7. Identify the last station of the line. - This is to avoid you from going the opposite direction. - Name of last station will be displayed on the LCD display at platform and also at the side of the train. - However not all will display the last station on the line. It actually displays the last station the train will end. - Example: I want to go to Osaka station. The train displays yellow line but written Shin-Osaka means I can still take this train because Osaka Station is within the line. Though the yellow line runs until Kyoto station it is not necessary every train will end there. Another tip for you is if you hear hidari gawa means left and migi gawa means right. These words will be mentioned when announced "door opens on your right/left" a minute before the train stops. When you are in huge major station like Osaka it can be a bit of a headache for first timers. There are so many lines and we did not know which platform to wait. Fortunately you can always ask the locals or authorities to help you. You might not understand what they say entirely and vice versa but they will try their best to assist you. So let me give you example of case study. You are always welcome to correct me if I am wrong. 1. My destination station is Itami-eki which is 伊丹駅 in Japanese. 2. My destination station is a big round dot meaning local and rapid service will stop by. 4. The price is ¥230. 5. There are 4 stops if I take local service and 2 stops if I take Rapid service. You should to take the rapid service to save time. 6. The line I can use is blue (Tokaido/Sanyo) and yellow (Fukuchiyama/Takarazuka). The blue line will continue with yellow line. 7. Last station on the line is Sasayamaguchi. Avoid taking train that displays Takatsuki because it goes the opposite way. Alternative: If I accidentally took the Kobe line I can always get off at Amagasaki without scanning out from the station and wait for the right train to come. My workplace is at a rural area called Kita-Itami and I am travelling from Tennoji. 1. My destination is Kita-Itami-eki which is 北伊丹駅 in Japanese. 2. My destination station is a small round dot meaning only local service will stop here. 3. Transit at Osaka station. Take Osaka loop line to Osaka station (outer loop goes clockwise while inner loop goes counterclockwise) then go to track no. 6. 4. The price is ¥500. 5. From Tennoji to Osaka Station: There are 4 stops if take Special Rapid service (big square dot) and 9 stops if take local service. From Osaka to Kita-Itami: There are 5 stops with local service. 6. From Tennoji to Osaka Station: Take loop line which leads to Osaka station. From Osaka to Kita-Itami: Take blue (Tokaido/Sanyo) and yellow (Fukuchiyama/Takarazuka). The blue line will continue with yellow line. 7. Last station is Shin-Sanda. I want to go sightseeing at Nara but I am staying at Kobe. I depart from Sannomiya station which is in the city center. 1. My destination is Nara-eki which is 奈良駅 in Japanese. 2. My destination has big round dot (Rapid) and big square dot (Special Rapid). 3. Transit at Osaka station and wait at track no. 1. 4. The price is ¥1,240. 5. From Sannomiya to Osaka: 3 stops with Special Rapid or 6 stops with Rapid. From Osaka to Nara: 10 stops with Special Rapid. 7. From Sannomiya to Osaka: Last station is Maibara. From Osaka to Nara: Last station is Kamo. I am staying at Shin-Imamiya and I want to go to Kansai Airport. 1. My destination is Kansai Airport station/ Kansaikuko-eki which is 関西空港駅 in Japanese. 2. My destination has big round dot (Rapid service) and big round empty dot (Regional Rapid service). 3. If I use Nankai Limited Express there won't be transit but we did not reserve so we transit Tennoji station and wait at track no. 15. 4. The price is ¥890. 5. From Shin-Imamiya to Tennoji: 1 stop. From Tennoji to Kansai Airport station: 9 stops. Always remain on same vehicle. 6. From Shin-Imamiya to Tennoji: Take any colour that goes counterclockwise. From Tennoji to Kansai Airport station: Take yellow line (Hanwa) or light blue line (Kansai Airport line). 7. Last station should display Kansai Airport station. The truth is we had a very tough time in the wee hours of dawn dragging all our one month luggage and endured the typhoon to get to the airport. Actually we took subway at Dobutsuen-mae first coz we did not stay exactly at Shin-Imamiya. Moreover the subway did not have escalator to go down and we had to carry heavy luggage from hostel to the station drenched in heavy rain because the reception refused to call a cab. We wanted to hire a cab to Shin-Imamiya so that we could skip the hassle to our nearest subway. But he told us that we could just walk to the subway which is about 500m next to our hostel. Yeah, we know its very near and easy to walk there on a sunny day but the wind could fly us away during that day. Just to say thank you for taking the time to put this together. It is very helpful and very well explained. I am using the information for a report on Kobe for my business degree. You are most welcome. Im glad this article serves its purpose in helping. All the best in your business degree. Japan: Where to go in Japan?